The centuries-old tradition of building altars to welcome and celebrate deceased loved ones fuses with present-day artists’ sentiments on the state of life and politics in the Day of the Dead 2012 exhibition at SOMArts Cultural Center. Elaborate, traditional altars and multi-dimensional art installations are on display in Calling on the Spirits to Face the Future: Día de los Muertos 2012. The annual Day of the Dead exhibition provides a way for more than 80 participating artists and more than 4,000 exhibition visitors & 800 touring school children to embrace the beauty of life and to honor the spirits of the dead. Calling on the Spirits to Face the Future is dedicated to the late Daniel del Solar, a Chilean-American media activist, poet and photographer, and the late John Edward Buchanan, Jr., Director of the Fine Arts Museums of San Francisco. Click here to watch a video made at last year’s exhibition. 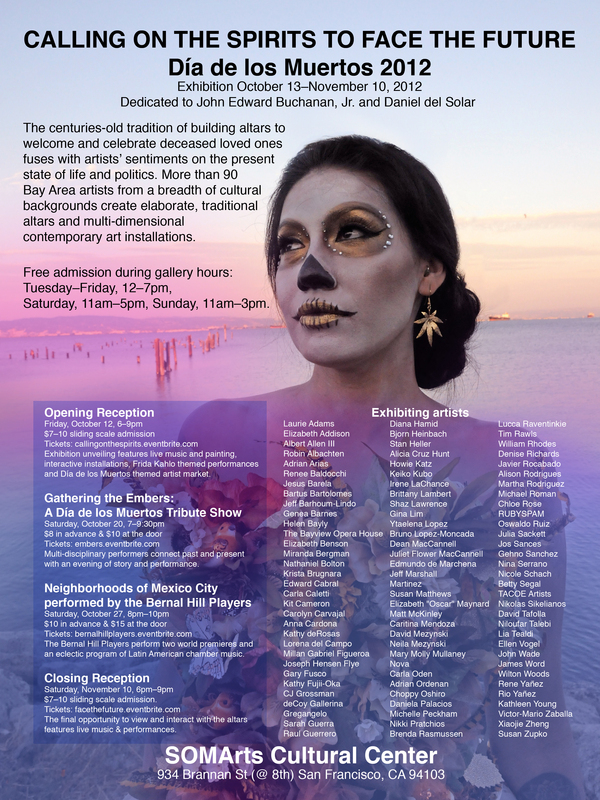 Posted in Art and tagged as artists, bay area, dia de los muertos, San Francisco, SOMArts, somarts cultural center.